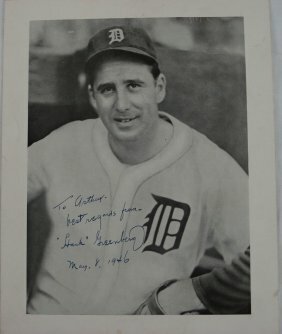 Hank Greenberg baseball cards and memorabilia have a special place in baseball history. Before there was Hammerin' Hank Aaron, there was Hammerin' Hank Greenberg. As an accomplished Hall of Fame player of Jewish descent, Greenberg's talent and achievements were heralded as proof of equality at a time when prejudice was at the forefront of geopolitics. In 1938, Greenberg hit 58 home runs, tying him with Jimmie Foxx for most in a season by anyone not named Babe Ruth. The five-time All-Star also won two World Series with the Detroit Tigers as well as two American League MVP Awards. When he was inducted into the Baseball Hall of Fame in 1956, Greenberg's collectibility was cemented in the hobby. 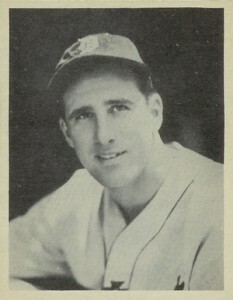 The Hank Greenberg rookie card hails from one of the most popular Pre-War baseball cards sets of all-time, 1934 Goudey Baseball. Unfortunately for collectors, Greenberg died in 1986, just as the autograph circuit for retired players was gaining popularity. As a result, he has a limited number of autographed items in the market, but they can be found. Cut signatures are the most cost-effective option as single- or team-signed baseballs and other items from his playing days can be rather expensive. Designated as R320 in the American Card Catalog, the 1934 Goudey set is revered in the hobby. 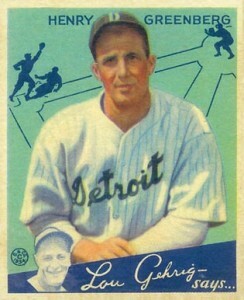 Hank Greenberg's rookie card being included on the checklist is definitely one of the reasons why. The colorful cards are some of the best looking pre-War cards ever produced. They measure a near square 2 3/8" x 2 7/8". High-grade examples are getting very difficult to find unless you have significant financial resources. 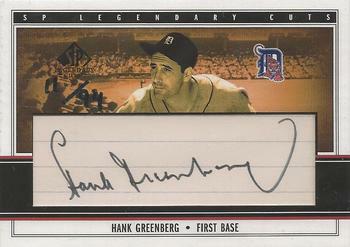 One of Greenberg's most popular Hank Greenberg cards is the classic black and white 1939 Play Ball. The professionally photographed head-and-shoulders portrait, color contrast and simplistic design are reasons that contribute to its desirability. 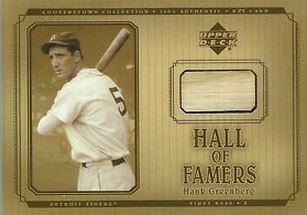 In 2001, trading card manufacturers produced a total of seven different Hank Greenberg game-used bat cards. Despite not being serial numbered, this is one of the most popular. The introduction of cut signatures would revolutionize the hobby forever. Being able to include authentic autographs of deceased players in current products was another one of Upper Deck's ground-breaking innovations during this time period. 1941 Play Ball #18 Hank Greenberg HOF Tigers PSA 4 !!! 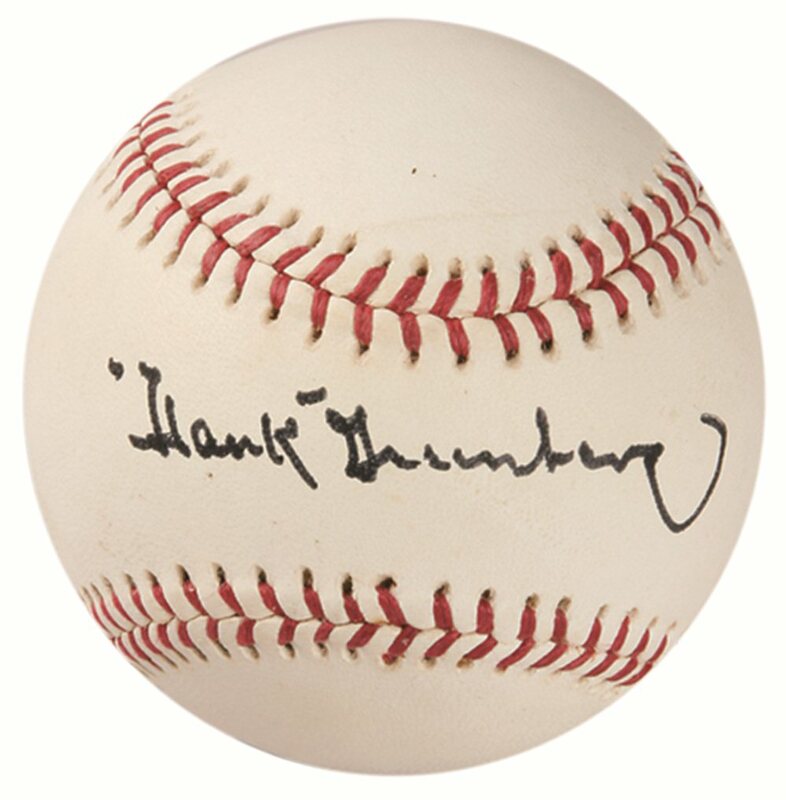 Below you will find an example of what Hank Greenberg's authentic signature looks like. This can be used as a first point of reference for determining the legitimacy of autograph memorabilia, but is not a substitute for having your items authenticated by a well-respected professional autograph authentication company. Some of the trusted sources within the sports memorabilia market include the following companies: PSA, JSA, Steiner, Mounted Memories and Tristar. Click on any of the images below to view full size photos. A very unique signature with several personalized characteristics. Written in cursive on a horizontal plane. The letter "H" starts with a small circle and the vertical lines are narrowly spaced. Depending on the writing instrument the "a" can be closed or open. The "K" has emphasis on the top of the starting lines. The "G-r-e-e" are legible while the "n" is implied. The "b-e-r" are discernible but small. The final letter "g" finishes with a flourish looking like a large "U" shape. VERY RARE! Hank Greenberg Signed Autographed Framed Baseball Photo JSA AH LOA! HANK GREENBERG PSA DNA SIGNED INDEX CARD CERTIFIED AUTHENTIC AUTOGRAPHED HOF!